April is National Oral Health Month, which is a wonderful time to schedule your child’s dental visit! Going to the dentist for the first time can be a scary thing for a young child, so we’ve put together a few tips to ensure a successful visit! Talk about the appointment: As soon as you schedule your child’s appointment, start discussing the dental office visit. Children, just like adults, are much more likely to succeed in anything when they are adequately prepared ahead of time. 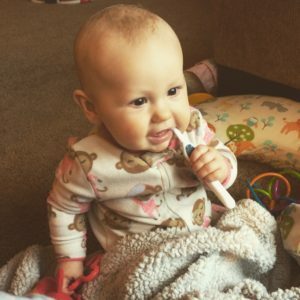 Talk about things like the process of the appointment (“first we will sit in the waiting room until your name is called, and then someone will take us back to the dental chair, etc.”), what the office looks like, what the dental chair looks like, and any other information you think would benefit your child. Talk about your dentist: Frequently bringing up your dentist’s name will help your child be more familiar when the time comes to actually meet him/her. Talk about what your dentist looks like (“Dr. Peterson is tall like a basketball player!”) and what your dentist likes to do outside of work (“Dr. Fritsche enjoys flying planes when he’s not at work!). Encourage good oral hygiene at home: Establish a morning and nightly teeth-brushing routine, and praise your child for taking good care of his/her teeth. Talk about how brushing and flossing teeth helps their mouth and whole body stay healthy! Positive reinforcement: If you know your dentist gives out free toothbrushes or balloon animals at each pediatric visit, use this as positive reinforcement! Lead by example: Showing your children that you value your oral hygiene will encourage them and show them what an important priority it is. Make sure you schedule regular check-ups with your dentist and discuss with your children how important it is to you to see the dentist regularly. Don’t let your own fears of the dentist perpetuate to your children: Children can smell fear, so if you have your own fears and anxieties about going to the dentist, don’t let your child see or hear this. Making the dentist sound scary will only intimidate your child and cause a negative experience. If you do have extreme fear of the dentist and don’t think you can handle taking your child, have a spouse/family member/close friend go instead. At De Pere Smiles, one of our greatest joys is providing dental care to our pediatric patients! Establishing good oral hygiene at a young age is vital to oral and overall health throughout the lifetime. If you ever have any questions, wish to schedule a tour of the office, or wish to introduce your child to Dr. Peterson or Dr. Fritsche prior to their appointment, we are more than happy to accommodate! We will work hard to make your child’s first visit go smoothly so they want to come back again and again!